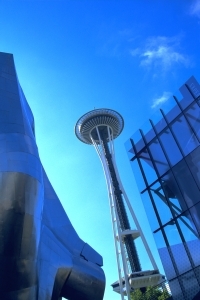 For 2012, AAEA has chosen to hold its Annual Meeting in Seattle, at the Washington State Convention Center in downtown Seattle. All meeting activities will take place at the convention center, which is across the street from our headquarters hotel, the Sheraton Seattle Hotel. In a change from past years, the 2012 Annual Meeting will take place in August, running August 12–14. So, be sure to mark your calendars with the new dates. You can learn more about the city of Seattle, by visiting the Visit Seattle website. A number of you responded to our post-meeting survey, and we greatly appreciate your feedback! We are committed to continually improving the Annual Meeting, so it is wonderful to know exactly what the meeting attendees think about the meeting. We’ve collected some of the most common comments from the survey and provided insight on what the association is doing to address these comments. The topics we heard most about include the Poster Tours, food and drinks at the meeting, and the dates of future meetings. We introduced the Tours of Selected Posters in Pittsburgh, and we were excited to see that many attendees participated as both presenters and participants. On the survey, 67% of respondents said the posters presented on the Tours were excellent or above average quality. Most of the comments about the Tours were positive—the set-up allowed for good interaction, the research was of high quality, and the information was well presented. Based on the feedback, Poster Tours will be held again in Seattle. While most feedback was supportive of the Tours, there were some issues that we are working to resolve. First, it was hard for some participants to hear the presenters. In 2012, the Tours will be placed linearly rather than back to back. They’ll also be in a larger space so the room is less crowded. The AAEA Staff is also looking into other options to make it easier for everyone to communicate. Second, there were a few people who had a hard time locating the Tours. We’ll have staff on hand in the poster hall to help people find their way, but we’ll also have signs helping attendees locate their tours. A map of the poster hall will be included in the program as well. Third, the logistics and lighting in the room made it difficult to see some of the posters. This is true for both the selected posters as well as the posters on the Tour. The posters were originally going to be placed in the public space outside of the ballrooms, but when the idea of Poster Tours came about, the posters were moved into the ballroom. The space in Seattle will be much more conducive to poster sessions! We received many comments on the food and drink selection at the meeting. The lack of coffee in the morning was, hands down, the number one complaint about the meeting. Please rest assured that we will remedy this situation in Seattle! We’re also looking into providing more refreshments throughout the meeting, but this will largely depend on the meeting budget. The Washington State Convention Center is a public space, so there are many food outlets throughout the building. And because we’re in Seattle, a Starbucks is never too far away! Some people suggested we be clearer about what will be served at the Welcome Reception and the Closing Reception. We’ll be sure to post that information on the website along with when you can expect other refreshments to be provided during the rest of the meeting. We’re sorry for any inconvenience these dates may cause. We hope everyone is still able to participate! Thanks again for joining us in Pittsburgh, and a big thank you for those of you who took time to complete the survey! We look forward to welcoming you to Seattle next August! Also, feel free to check out our response to the last Annual Meeting survey to see past examples of how AAEA has adapted based on your feedback. If you’re interested in presenting in Seattle, don’t forget that the deadline to submit is fast approaching. All abstracts/proposals for Selected Presentations, Organized Symposia, Case Studies, and Frontier Sessions must be submitted by January 16. Submissions can be made using AAEA’s online abstract system. You must be a 2012 AAEA member or pay a non-refundable $25 submission fee in order to submit to the 2012 Annual Meeting. You can submit your abstract or proposal using AAEA's online abstract system. At the last AAEA Annual Meeting, AEPP Featured Articles Editor Ian Sheldon recorded interviews with three featured speakers from the meeting, Robert Hall, John Quiggin, and Martin Ravallion. These interviews, which are available online now, are a great example of the type of speaker you can expect to see at the next Annual Meeting in Seattle. Robert E. Hall, Stanford University: "Why is the U.S. Recovery from the Financial Crisis So Sluggish?" John Quiggin, University of Queensland: "Stabilizing the Global Climate: A Simple and Robust Benefit Cost Analysis"
Martin Ravallion, World Bank: "Growth and Poverty Revisited"
AAEA will be announcing who has been chosen as the featured speakers for the 2012 Annual Meeting in Seattle in the upcoming months.